Educational atomic physics animation : Discovery of electron took a long journey over hundreds of years from lightning to discharge tubes to cathode rays and finally discovery of electron by J. J Thomson, this 50 minute animation looks at every aspect of this discovery. 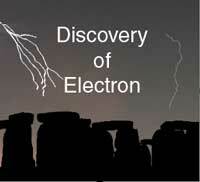 How electron was found to be the subatomic particle? a) Description of the discharge tube- what is happening inside the discharge tube, why high voltage is essential to produce glow, why low pressure is required for glow………. Electrons are the negatively charged subatomic particles. They have negligible mass of about 9.1 * 10(-31) Kg and a charge of 1.6*10(-19) C.
Sir John Joseph Thomson first discovered the electron in 1897 while studying the nature of cathode rays. The cathode rays were a subject of interest from over almost two centuries. Many Scientists like Faraday, Goldstein, Perrin, Crooke, and Hertz investigated on the properties of the cathode rays. They were produced by the negative electrode, or cathode, in an evacuated tube, and traveled towards the anode. They travel in straight lines and cast sharp shadows. They have energy and can do work. Though the properties were known, the nature of the particles was still unknown. In fact the scientific community was divided into two groups one group believed that cathode rays as nothing but corpuscles (particles) while the other group believed it to be an electromagnetic wave. In 1897, SirJ.J. Thomson, drawing on work of his colleagues, studied the nature of cathode rays. He first subjected the cathode rays to an electric field and then to a magnetic field individually. The remarkable achievement for him was that he could not only bend the rays in the presence of magnetic field but also could successfully bend the rays in electric field. This led to the conclusion that cathode rays are not electromagnetic waves because electromagnetic waves are not affected by either magnetic field or electric field. He concluded that they are nothing but charged corpuscles (particles). Further the deflection of rays towards the positive plate led him to the conclusion that they are beam of same kind of particles with a negative charge. To determine the charge to mass ratio of the particles he then subjected the beam to simultaneous crossed electric and magnetic fields perpendicular to the direction of the motion of the particles. He initially switched off both the fields and noted the equilibrium position. He then switched off the magnetic field and noted down the deflection point of the cathode rays in the presence of only electric field. He noted down the deflection.Then he applied the magnetic field in such a way that the cathode rays were brought back to the equilibrium position. Now at equilibrium position, the electric and magnetic force on the charged particle are equal. Using the equations of motion he calculated the velocity of the particle. He then carried out the calculations to determine the specific charge (e/m) ratio of the particles. J. Thomson confirmed that an almost constant value of e /m was always obtained under various experimental conditions and even for different gases and metals. He therefore concluded that the cathode rays are a collection of the same kind of particles. The e/m value was found to be 1.76 * 10(11) C/Kg. He compared this value with the value of hydrogen atom and found that the mass of these particles were less than that of the hydrogen atom (lightest element on earth). This led him to the conclusion that the electrons are constituents of the atoms and thus atoms are divisible. Ans: A gas-filled tube, also known as a discharge tube is a device in which a gas conducting an electric current emits visible light. It is usually a glass tube from which virtually all the air has been removed (so that it ‘contains’ a near vacuum), with electrodes at each end. When a high-voltage current is passed between the electrodes, the few remaining gas atoms in the tube (or some deliberately introduced ones) ionize and emit colored light as they conduct the current along the tube. Fluorescent lighting, CFL lamps, mercury and sodium discharge lamps and HID lamps are all gas-filled tubes used for lighting. Neon lamps and neon signage (most of which is not neon based these days) are also low-pressure gas-filled tubes. Ans: We have described it in the details section, please go through that and if there is any specific question we will be glad to answer it. Ans: We wish that we could provide it for free, there are some of them freely viewable in the downloads section, why not try them out? Ans: could you please re-phrase the question, I cant figure out what is it that you want to know. Ans: From the cathode (negative electrode) material. Ans: Thanks for appreciating the animation, your negative feedback are also welcome as they help us to improve. Ans: It took a long time to discover neutron because hunt for charged particles was relatively easier (they were visible as flashes) and only after the charges balanced that the hunt for balancing masses began. Neutron remained largely hidden because it did not produce a flash and it was not deviated by magnetic field. It was thought to be photon or a gamma ray for some time but differentiated itself (thanks to Curie and Joliot ) by being non-ionizing and was finally given mass value by Chadwick. Ans: Yes, ejection of electrons by gases resulting into their ionization is common in-fact, Goldstein and others failed to deflect cathode rays, due to excessive ionization of the gas present in the discharge tube, by electric field. Thomson reduced the pressure, minimized ionization, and was able to see the anticipated deflection.